20 grams of complete plant protein. 4 Billion CFU** - Live unique IS-2 probiotic. 4,000 Spectra ORAC antioxidant activity. 100% of DV of 15 key vitamins & minerals. Fruits, vegetables, legumes, seeds, ancient grain...kissed by the sun, nurtured by the rain, embraced by the earth...the source of well-being as nature intended. Not only are plants a great source of nutrition...they can also be a great source of protein. Protein doesn't have to come from animals (grazing cows can be thankful for that) it can just as easily come from the earth. When sourced that way, earth-harvested plant protein can give you all the protein you need while being more sustainable than animal protein, environmentally-conscious and non-gmo...all with a friendly carbon footprint. When eating a healthier diet (or at least trying)...adding a vegan protein can be a great addition to your day. It's great-tasting nutrition at 190 calories♦ without high level of fat. Nutritious, plant-harvested, protein...vital nutrients...fruit, vegetable and green concentrates...probiotics, digestive enzymes, flaxseed EFA, plus all the goodness of ayurvedic botanicals. That's the broad-spectrum nutrition you get in every Solgar Spoonfuls. Plant-sourced multi-protein blend derived from peas, brown rice, hemp seed and pumpkin - excellent source of protein. Unique greens blend including concentrates of Chlorella (cracked cell wall), Barley Grass, Spirulina, Alfalfa Juice Powder, Dandelion Leaf and Watercress. A broad spectrum of Spectra ORAC blend comprised of over 25 fruit, vegetable, botanical and phytonutrient concentrates and extracts that help neutralize body-cell-damaging free radicals. The ingredients within Spectra ORAC are active against the five major types of free radicals in the body. 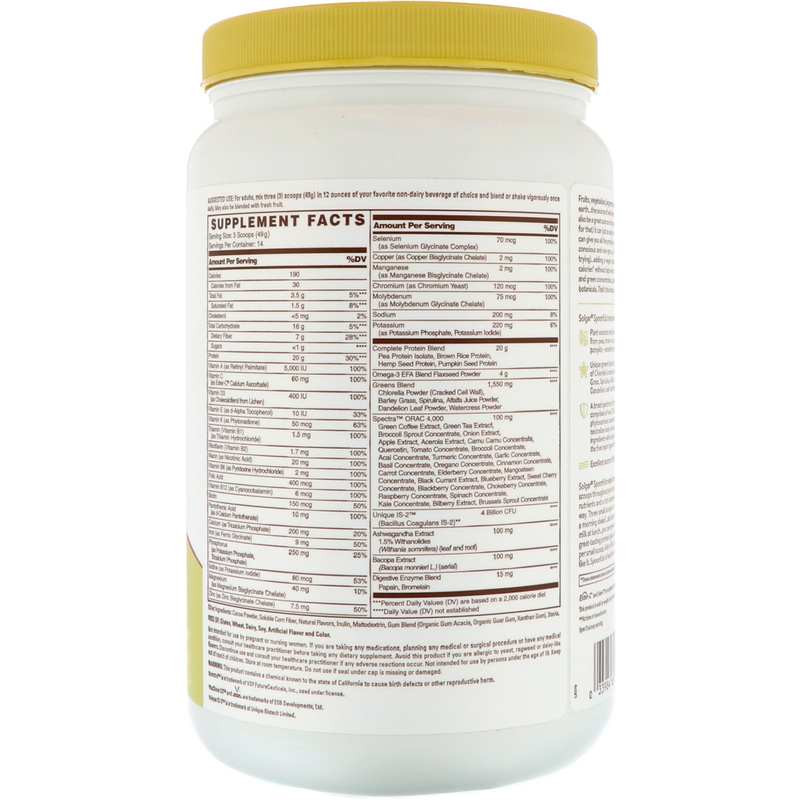 Unique digestive Enzyme Blend containing Papain and Bromelain. Energy supporting B-Vitamins, which aid in the conversion of food into energy. Vita-Shine D3 Unique, vegan lichen-sourced cholecalciferol. Accented with traditional Indian botanicals from the ancient system of Ayurvedic health practices. Solgar Spoonfuls makes it easy to add a plant-based source of protein to your diet every day. Three small scoops throughout your day gives you 20 grams of protein plus whole food and plant-based concentrates, nutrients and a rich complement of essential vitamins. 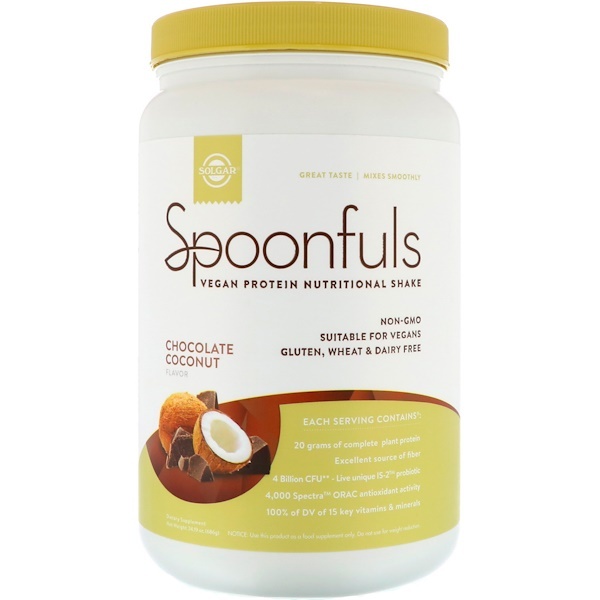 With Spoonfuls, you can take your protein...your way. Three small scoops in a shake in the morning...is a great way to start your day. Not in the mood for a morning shake?...add one small scoop to your favorite yogurt. Then, add a small scoop to your almond milk at lunch...you can even add it to a water bottle and take it on the go. Easy-mixing Spoonfuls gives you great-tasting protein plus a full complement of nutrition where and when you want it...and it's 55 calories per small scoop. 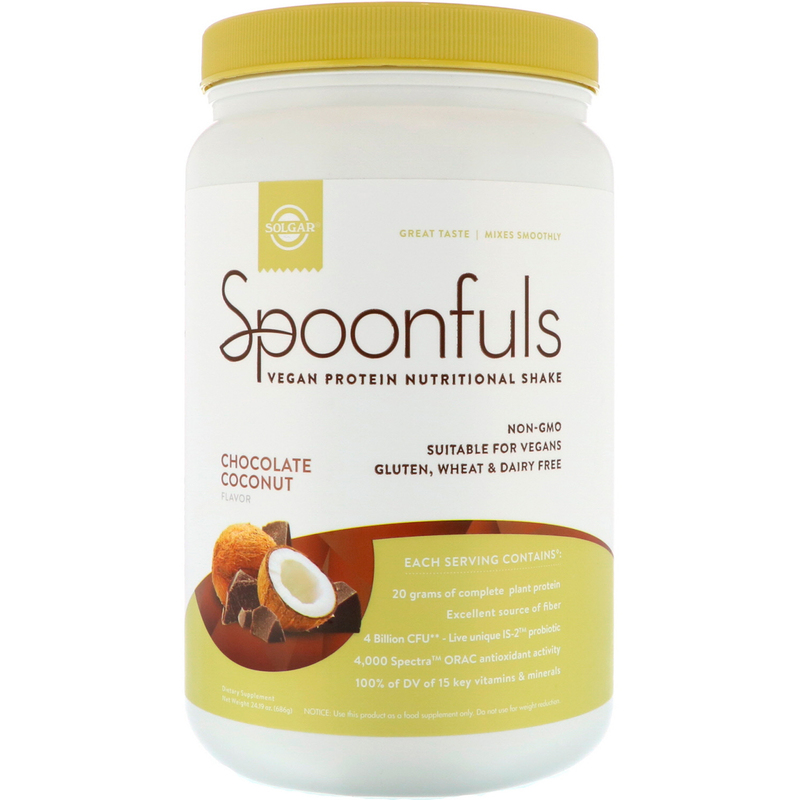 AM or PM, with Spoonfuls from Solgar you get wholesome, dairy-free protein anyway you like it. Spoonfuls of earth-harvested plant protein never tasted so good...and was never so easy. For adults, mix three (3) scoops (49 g) in 12 ounces of your favorite non-dairy beverage of choice and blend of shake vigorously once daily. May also be blended with fresh fruit. Cocoa powder, soluble corn fiber, natural flavors, inulin, maltodextrin, gum blend (organic gum acacia, organic guar gum, xanthan gum), stevia. This product is sold by weight, not by volume; therefore settling may occur. Not intended for use by pregnant or nursing women. If you are taking any medications, planning any medical or surgical procedure or have any medical condition, consult your healthcare practitioner before taking any dietary supplement. Avoid this product if you are allergic to yeast, ragweed or daisy-like flowers. Discontinue use and cunsult your healthcare practitioner if any adverse reactions occur. Not intended for use by persons under the age of 18. Keep out of reach of children. Store at room temperature. Do not use if seal under cap is missing or damaged. ****Dairy Value (DV) not established.